I coach female entrepreneurs to grow their businesses by planning and implementing success strategies. I also coach executives to improve their communication, decision-making, and teams. Hi Alyssa, I would like to speak with you briefly to see if you're a good fit to coach me. Please contact me at your earliest convenience. Alyssa Hogan is a Transformation Coach, Business Strategist, Corporate Leadership Trainer, Speaker, and Author. From teen mother to Transformation Coach, from the projects in Orlando to Florida State University graduate, from victim of domestic violence to a Survivor, she is a remarkable life coach, inspirational speaker, facilitator of change, and influential community advocate. She travels internationally sharing her story of the trans-formative power of God, after the loss of her husband, home, and job and living life to the fullest. Alyssa represents authenticity, and is passionate about women, wealth building, and the community. She was previously the Vice President of McCarthren Services, Inc. for 10 years. The founder of Alyssa A Hogan Enterprise, a coaching and consulting company and tax consultant. She has coached and trained hundreds of entrepreneurs and leaders, improving their processes to become more efficient and productive, and to respond to market changes faster while providing better service to customers. She has developed employees into innovative leaders and transform company’s culture. Previous professional experience includes organizations such as the City of Orlando, University of Central Florida, and Orange County Head Start. 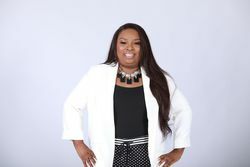 Equipped with a Bachelor of Arts in Criminal Justice from Florida State University and Master’s in Business Administration from Webster University, she is on a journey to receive her doctoral degree in Organizational Leadership and Development. She has over 15 years in social services management and entrepreneurship. Have you worked with Alyssa? Tell your friends! Alyssa hasn't submitted any articles.